Orbiting our dusty red neighbor are two puny potatoes, Phobos and Deimos. 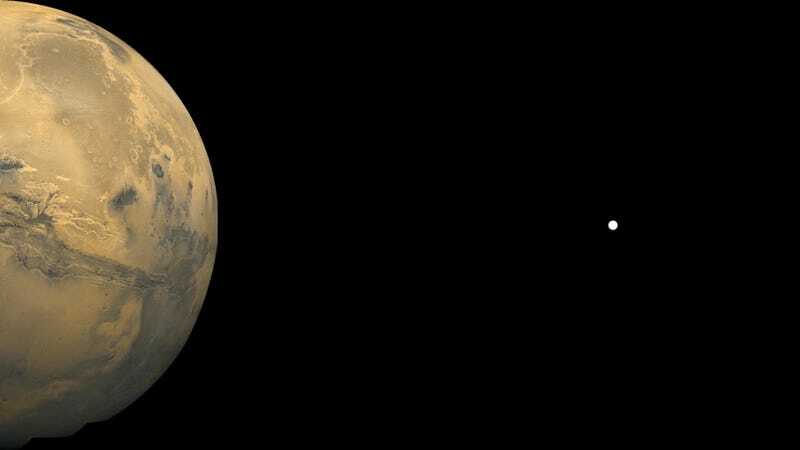 They look like they belong among the worst (but not the absolute worst) moons in the solar system, but their existence might tell a crazy story about Mars’ history. A Purdue graduate student built a model to figure out how Mars’ moons Phobos and Deimos formed. His wild conclusion: it’s possible that during the planet’s history, it has cycled, and will continue to cycle, between having a ring system like Saturn’s and having increasingly small, gravitationally-bound rocks in tow. Our own Moon likely emerged after a large impact some time during Earth’s very early history, around four and a half billion years ago. This would have left a rock ring which soon clumped into a large sphere. It’s possible Mars experienced a similar collision around the same time. “My argument is that Phobos... was not produced in an impact,” study author Andrew Hesselbrock from Purdue University in Indiana told Gizmodo. Instead, “The largest impact created a large satellite that, instead of crashing onto Mars, ripped apart.” In other words, Mars might have once had a fairly sizable moon that was ripped to pieces long ago, creating a ring system. Over time, this ring system kept clumping and falling apart under the pull of Mars’ gravity until today, all that remains is two tiny moons, Phobos and Deimos. We know Phobos is falling apart—so eventually, it may become yet another ring in this Martian cycle. Hesselbrock’s simulation comes from data plugged into physical equations and crunched on a computer. The model implies that three to seven of these ring-moon cycles could have occurred over the course of Martian history. In the case of Phobos, it predicts that 80 percent of the moon will deposit itself on the Martian surface, while 20 percent will form a whole new moon 70 million years in the future. Hesselbrock published his result in the journal Nature Geoscience today. But what about Mars’ other potato, Deimos? There’s a point around six times Mars’ radius, called the synchronous orbit, where the speed of the planet combined with its gravitational effects will keep a moon from either flying away or moving closer. Deimos sits outside this point, and may eventually get further and further away from Mars until it escapes. Phobos sits inside this point, forever ensnared by Martian gravity. Many people have suggested Mars’ tiny moons were captured asteroids—after all, Mars sits right near the asteroid belt. But Hesselbrock and others find that theory unlikely—both Phobos and Deimos seem to have orbits far too circular and aligned with Mars’ equator to imply such an origin. Larger planets like Saturn have small, captured moons that take distant, wild, eccentric orbits around the planet. Of course, we’ll never in any of our lifetimes know for sure if this is what really happened, because A, this is just a physical model and B, the oldest of us only live around a century, not millions of years. However, if Hesselbrock’s model is right, we might be able to see deposits of ancient moon dusts on the Martian surface. If scientists found telltale sediments on Mars, it could clue us in to this ring-satellite cycle. But for now, who knows. The future is a mystery. Chaos reigns.